Harrowing footage has emerged of a terrified dog being thrown into the simulated rapids of a deep pool by its handler during the production of a movie in Canada. 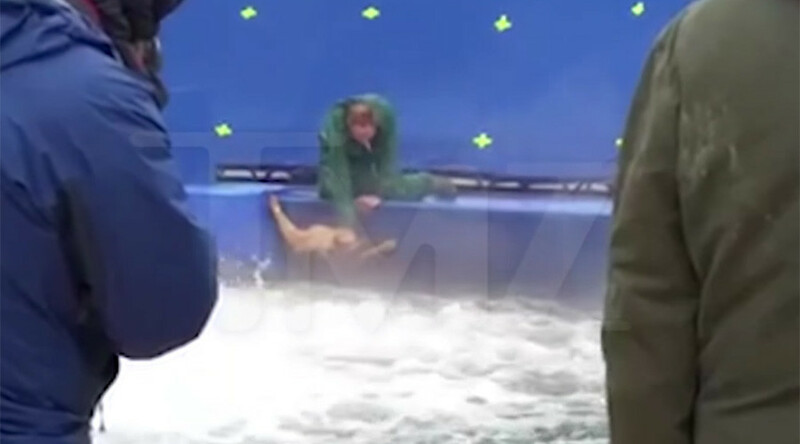 A video from November 2015, recently obtained by entertainment website TMZ, shows the heart-rending moments prior to the German Shepherd, named Hercules, being flung into the water as shooting took place for ‘A Dog’s Purpose’. The dog is seen at the edge of the pool desperately struggling to free itself from the grip of its handler, who initially tries to pacify the animal by stroking its head. However, the man soon makes forceful and repeated attempts to maneuver Hercules into the pool despite the fact it furiously claws at the side, clearly terrified and unwilling to enter the water. The video then cuts to the aftermath of the German Shepherd being forced into the pool as two members of the production team - already in the water - call out to the dog, which soon becomes submerged. i wanted to see #ADogsPurpose really badly... but after reading about what they've done on set, i'm heartbroken. Other members of the crew are heard repeatedly shouting “cut it, cut it” in the background, their voices quickly becoming panicked as the dog struggles to resurface. The video then ends before the dog is retrieved but a statement Thursday from the film’s producers, Amblin Entertainment, confirmed that Hercules is now “happy and healthy” and suggested an investigation into the shoot will take place. According to TMZ, up to five dogs were used during the production of the movie. “While we continue to review the circumstances shown in the edited footage, Amblin is confident that great care and concern was shown for the German Shepherd Hercules, as well as for all of the other dogs featured throughout the production of the film,” the statement reads. One of the film’s producers, Gavin Polone, said he was furious by the treatment of the animal.